The Kansas State Normal School, Emporia, Kansas, published a bimonthly periodical. 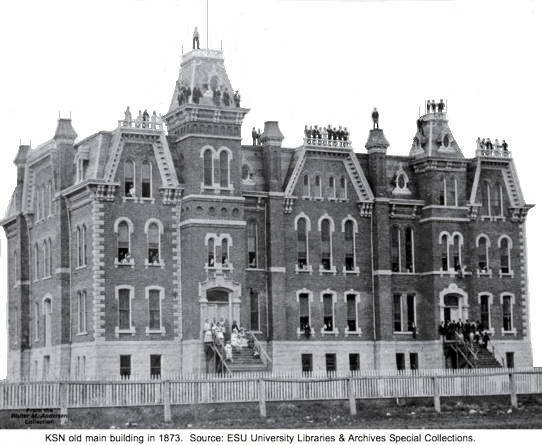 In 1863, only two years after Kansas entered the Union, Kansas State Normal (KSN) was founded through an enactment of the Kansas legislature, and KSN became the second state normal school established west of the Mississippi River. The Civil War and the struggles of new statehood delayed the opening of KSN until February 1865. Although enrollment increased steadily during the early years, financial issues and the destruction of the main building threatened school closure. With the support of the Emporia community and dedicated faculty, the school persevered to become one of the nation's most recognized schools for training teachers. In 1923, the Kansas State Normal School name was changed to Kansas State Teachers College to reflect the national trend of normal schools becoming less of secondary schools and more of collegiate schools offering bachelor and master degrees. In 1974 the name was changed to Emporia Kansas State College and in 1977 the name was changed to Emporia State University.